Cross-platform MySQL and PostgreSQL GUI with data grid, schema builder and interactive charts. Datazenit is a web-based database administration tool. It features smart data grid, query builder, schema editor, live charts and raw query editor with auto-complete. The goal is to build modern and intelligent database tool that would increase productivity. Get Datazenit. The schema editor has been designed with developer productivity in mind. It is equipped with intelligent features similar to the ones you could find in an IDE. 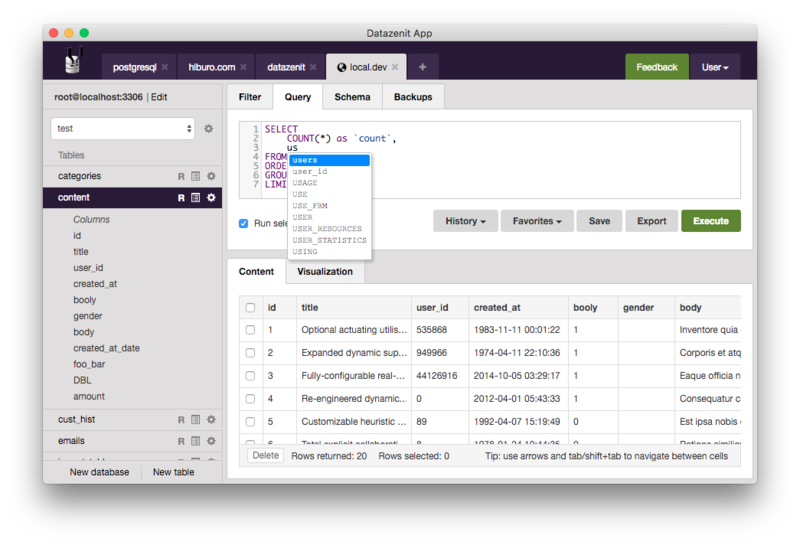 Users can choose to query data via graphical user interface instead of a classic raw query editor. Query builder supports multiple conditions, sorting and more. Various chart styles can be used to create effective visualizations, like scatter, line, area, bar and pie chart. Best of all – they can be shared or embedded. Enjoy advanced data grid with different editors like textarea, dropdown, checkbox and a calendar for easy date picking. 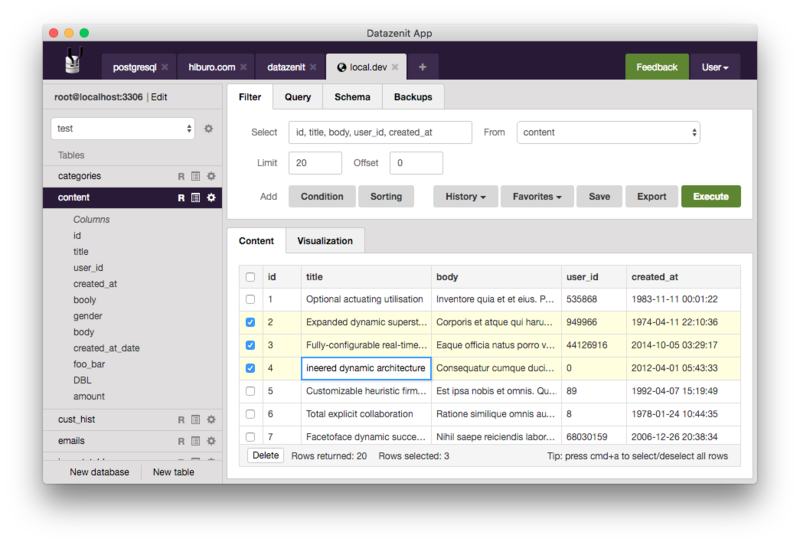 Datazenit is the first database administration tool that introduces team collaboration features. Users can share connections, queries and charts. User productivity is one of the main goals for Datazenit. Quickly jump between connections, databases and different actions using fuzzy search navigation. 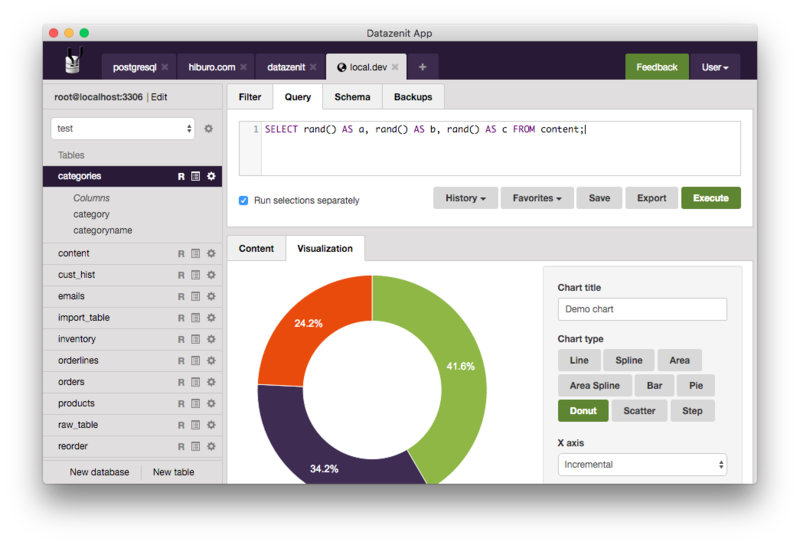 Datazenit can easily export data as SQL dumps or CSV files. It has the ability to create automatic snapshots of your database and store them as backups. Database credentials are encrypted with an AES algorithm and only decrypted when connecting to the database server. Datazenit can help make sense of your data. Download Datazenit or learn more about our features.